WOW – stunning – spectacular. It was hard to think in more than single words as I watched the deafening end of Aeneas Wilder’s exhibition at the Mead gallery at Warwick Arts Centre. 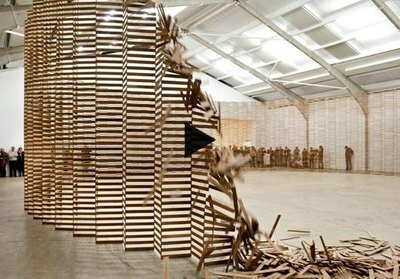 Untitled #162 was a huge installation built entirely from small, identical lengths of wood in the gallery. It took the form of two rooms and a narrow corridor connecting them, several feet above head height. Wilder created this and his previous works with no fixings. At the end of every exhibition he has a kick down – and attending it was the hottest ticket in town today, and an unforgettable sight.